We want to help you create the hen party accessories that will make your hen night (or birthday party ) an unforgettable day. Our hen party rosettes or birthday rosettes can help you create this. They are something that is inexpensive and yet personalised to give you a theme for your night. At the same time leaving all your guests with something that can be there for them to take away as a souvenir of the event. Colour co-ordinate your hen party rosettes to your theme. We can colour-co-ordinate the rosette ribbons to match the theme of your evening. It doesn’t matter to us, or to the price whether you have all the rosettes in the same colour or whether you decide to have different. For example, to differentiate the one for the bride from the ones for the guests. All our hen party rosettes come complete with a fastener to attach to your clothing. 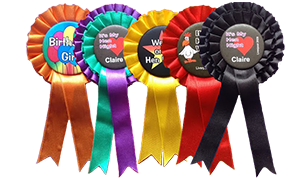 Hen party rosettes add that extra bit of colour to your event, particularly if you are dressing up with other items as wee. Of course you could just decide to give a rosette for the bride and have simple badges for the guest. Again this is not a problem and we can theme the badges to match the style of the rosette centre. All have a standard theme for your day. Tell us your personal requirements. We make all the rosettes ourselves. So not only does this ensure a quick delivery, but it also means that we are in total control of the process. We can make whatever individual changes or request you have regarding the design of the rosette. For additional personalising of the hen party rosettes you can also have the tails printed with a message of your choice. This ensures that your rosettes are truly personal to your party and the venue.